I usually do not interfere with the algo trading, but because of the recent price pump and further analysis I need to step in for V4. For weeks on end the market stayed relatively stable since January 28. Until a couple days ago on February 8th, marked with number 2 in the screenshot. The price jumped from ~3000 to ~3200 EUR per Bitcoin. If we take a closer look at January 6th, we saw a very similar price jump, marked number 1. This is obviously a manipulative action by a whale or institution. We all know this happens. When we take a closer look at the period marked by 1, we will see a sharp decline after the whale is unable to move the price higher and take advantage of the smaller retail traders. This is also the reason why you see those flashing buy walls in the depth chart, those buy walls are not there to buy Bitcoins, but rather give false confidence to traders, and to support the pumped price to prevent panic sell situations and wiping out their pumps' value. In the meantime hoping that prices will go up. Once that didn't happen in 1, they sold everything after 4 days. Let's take a closer look at what happened before. The biggest candle though in 1, happened on Friday at 4pm UTC. Guess at what time the biggest candle in number 2 was? Yes, 4pm UTC on a Sunday. Both move the price up with around 200EUR and both are in the weekends, I suppose the whale doesn't trade in the weekends because he has a day job during the week, but he trades in the weekends because that's when the retail traders have time to take a look at BTC prices and possible trade when they see a pump. Why am I concerned and how does this relate to our strategies? The reason why I'm concerned at all is because of the overall inaction of the market, which is bad for V4 and V5 as it trades trends. These price pumps are causing our indicators to trigger our buy setups, as due to a flatlining market, indicators get triggered more easily. V4 and V5 can not catch those pumps, that is not what it is designed for, (it's trading trends), so what will happen is that we buy in at the top. 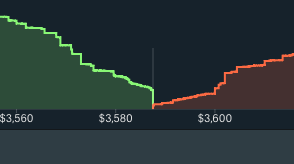 When the price doesn't move, and the whale pulls out, taking our portfolio's down with it. It will likely trigger our hard exits and end up in 5-7% loss. This scenario and risk applies more to V4 as V4 gives more room. Slightly less for V5 as V5 exits earlier when there is no action to be found when holding a position, but may happen if the timing is bad. This is why I was talking about the lower time-frame supporting strategy, to get out of the market earlier once this is happening. In 1, you can see the crash is suddenly happening and becomes one big red candle. With lower time frames we receive some sort of warning and possibly act earlier. On hourly candles it's just happening. Why doesn't the price move after such a pump? At the moment there's just no new money incoming. The Bitcoins currently mined are all sold to the market at current stable prices. If someone would pump the prices $1000 higher, not regarding any FOMO, we will trade horizontally at that price. No constant influx of new money will keep prices now as is. This is basically happening now, we trade horizontally at €3K and at €3.2K as the difference of €200 was just caused by one entity. Nothing changed in the rest of the market. I can let the strategies run and pretend everything is fine but considering what is happening and what I'm seeing, I'm taking action, and working on a short-term solution. Making long term profits is based on probability. Based on my analysis, I put my money on a crash incoming any day. Simply because, there's no new money and manipulation is pretty obvious. First, the supportive strategy development will be started by next week as planned. However, this show is happening now. Since V4 runs the biggest risk, I've put V4 on pause right now, as I'm working on a solution. Already under way and in development and hopefully live within a couple days. No further action will be required for V4 subs as trading will continue once the update is pushed. For V5, the buy setup indicators are now negative, so unless the market moves again, it's not likely to buy in. I do not predict though, and I do not hold any value in being right or wrong, as this is purely based on my views of probability. With that said, it's going to be a busy week as a lot if things are in development at the moment and for release soon. Stay tuned.